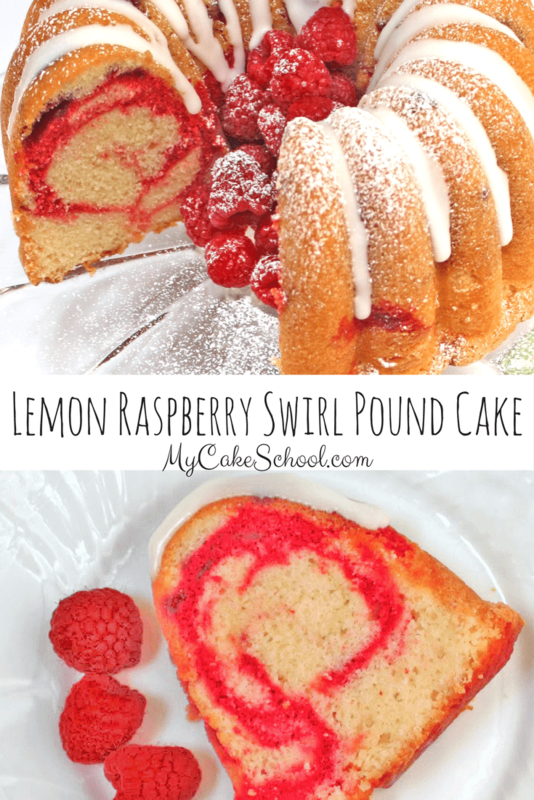 Lemon and Raspberry are a match made in heaven in this moist and flavorful homemade Lemon Raspberry Swirl Pound Cake recipe! One thing that you’ll notice with our Lemon Raspberry Pound Cake recipe is that the cake is not quite as dense as our other tried and true Classic Pound Cake Recipe. I really love the texture of this buttery cake, and the flavor is out of this world. 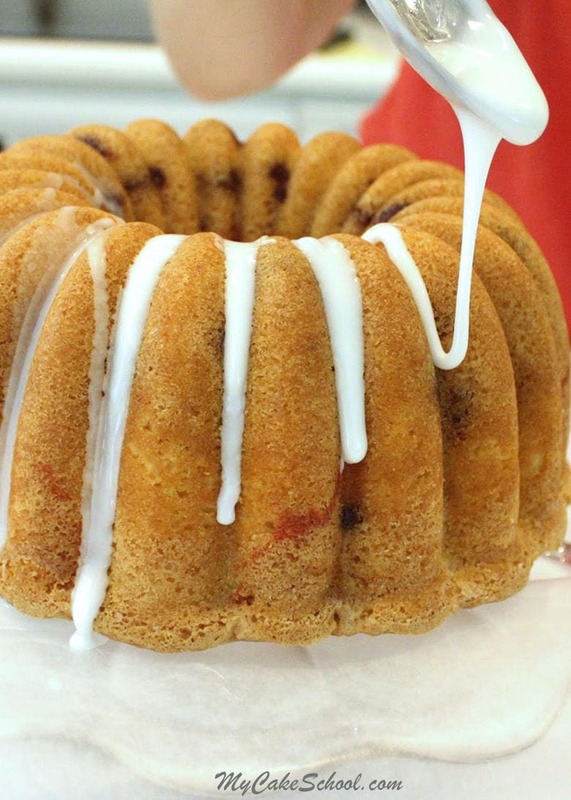 This moist pound cake is a twist on an old fashioned 1-2-3-4 cake. These delicious cakes are always a favorite, and are named for the proportions of four of the basic ingredients: one cup of butter, two cups of sugar, three cups of flour, and four eggs. You’ll find our deliciously fruity take on this classic 1-2-3-4 pound cake recipe below, complete with a splash of tartness from the lemon juice, a scoop of raspberry jam, and an added flavor boost from extracts and a lovely lemon glaze. 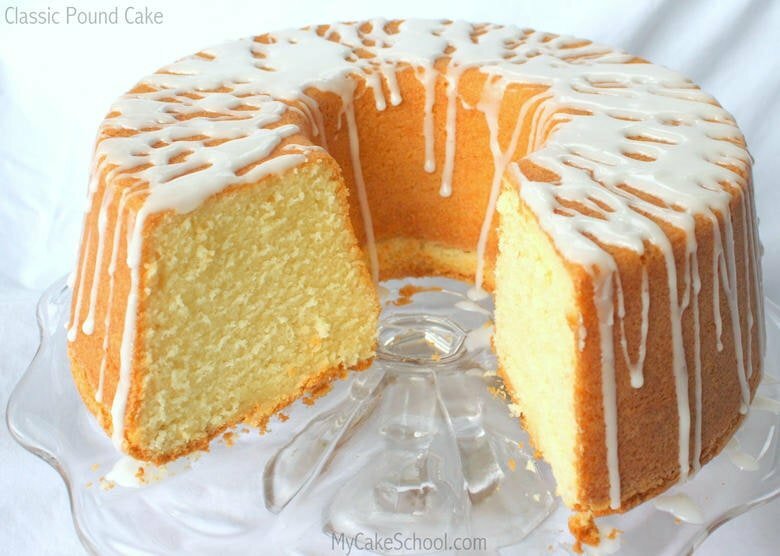 This pound cake recipe, as you’ll see below, couldn’t be simpler to make. However, we thought that it would help to see the process of creating the “raspberry batter” and how we incorporated it into the cake. After whipping up the lemon cake batter, we reserved one cup of the batter (as seen below) which would become our lovely raspberry batter for swirling. We stirred in seedless raspberry jam, raspberry extract, and a touch of red food coloring. The shade of red from the raspberry jam alone just wasn’t very….pretty. We opted to add a touch of red just to give it a little pop, but this step is completely optional. Either way, it’ll taste fabulous! 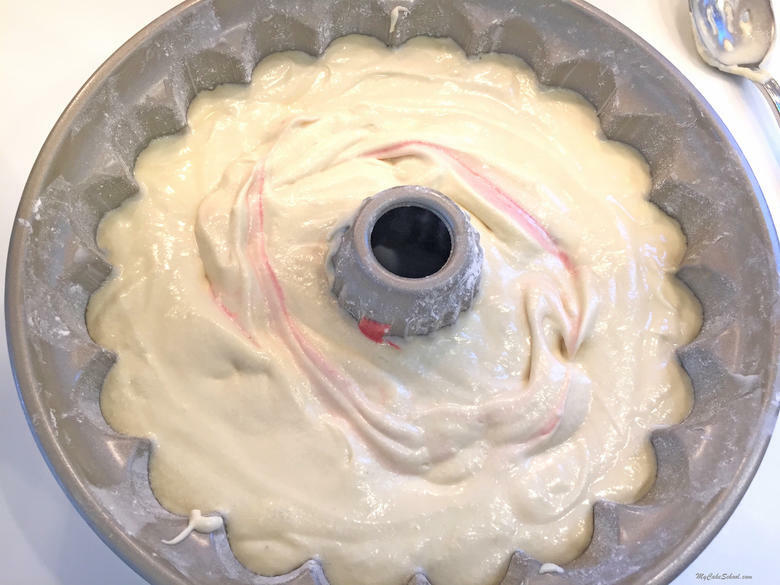 Next, we filled the greased & floured bundt pan, added some of the lemon batter, followed with the raspberry batter, and then finished with more lemon batter. We gave it a little swirl here and there by lightly dragging the spatula through. You can see just a trace of raspberry swirl in the final shot before baking. We started and ended with the lemon batter so that the swirl would for the most part be contained within the center of the slice. Once baked and cooled, we applied the lemon glaze. Ahhhh…I just love applying the glaze. There’s something so satisfying about those drizzles, and it really dresses up the cake! You can use a disposable piping bag with the tip snipped away if you’d like, but we opted for a spoon. 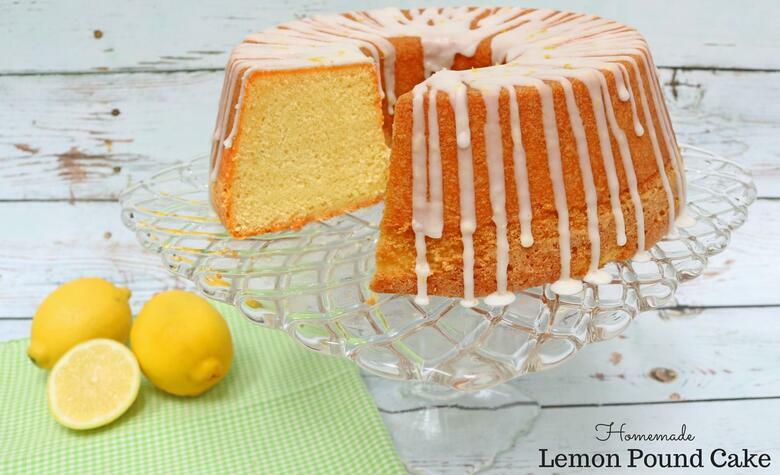 This lemony glaze gives us a wonderful burst of flavor. 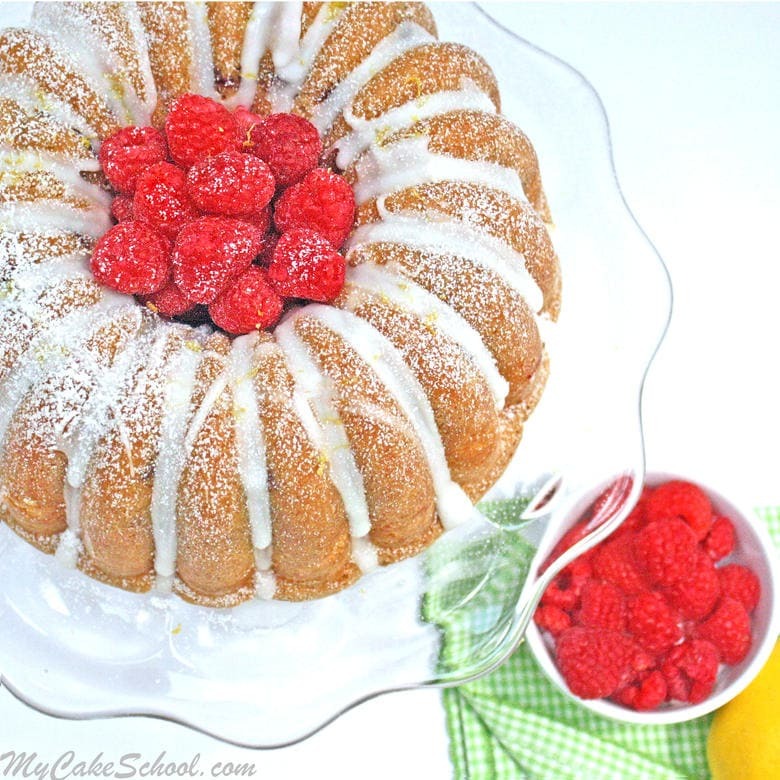 We filled the center of the bundt cake with raspberries and dusted the cake with powdered sugar as a final touch! Pound cakes are not only very simple to put together, but they are SO easy to wrap and pop in the freezer! Perfect for those days when guests drop by on short notice, or when you just need a little something for your sweet tooth! As much as I enjoy cake decorating, it’s nice to have desserts now and then that require nothing more than a simple glaze or dusting of powered sugar. 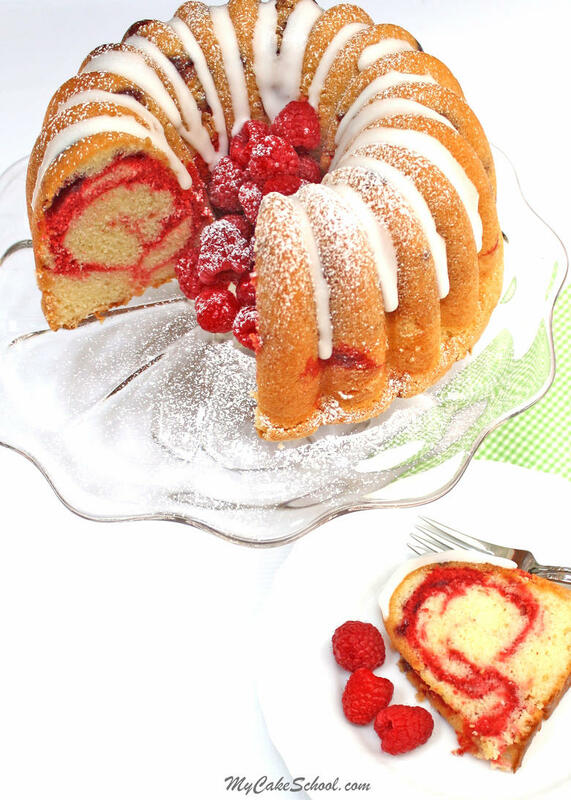 We hope that you love this Lemon Raspberry Swirl Pound Cake as much as we do! 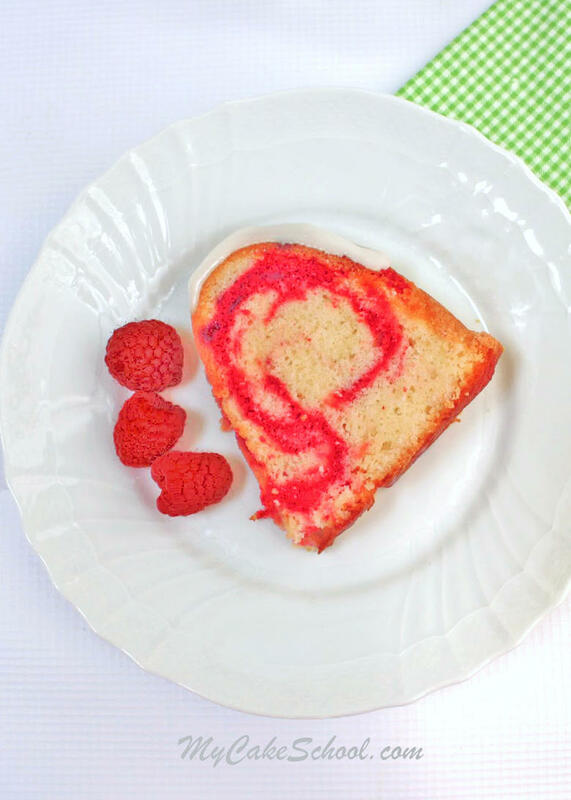 Mom (our “BeBe”) has made at least five versions of this recipe in the past week…making slight adjustments each time until we had the PERFECT Lemon Raspberry Swirl Cake. This is IT! If you give this recipe a try, we would love for you to share your comments and photos in the comments below. Happy baking! **For best results when using a tube or bundt cake pan, lower the oven rack. I lower mine to the next to lowest position in the oven. In a separate bowl, add the cake flour, baking powder and salt. Whisk at least 15 seconds to blend and set aside. Add eggs one at a time mixing after each egg until the yellow is blended into batter. Add flour mixture alternately with the milk, at this time also add the extract, lemon juice and zest. Begin and end with dry ingredients (3 additions of dry, 2 of wet). Blend after each addition just until ingredient is blended in.....Do not over mix as this could dry the cake. 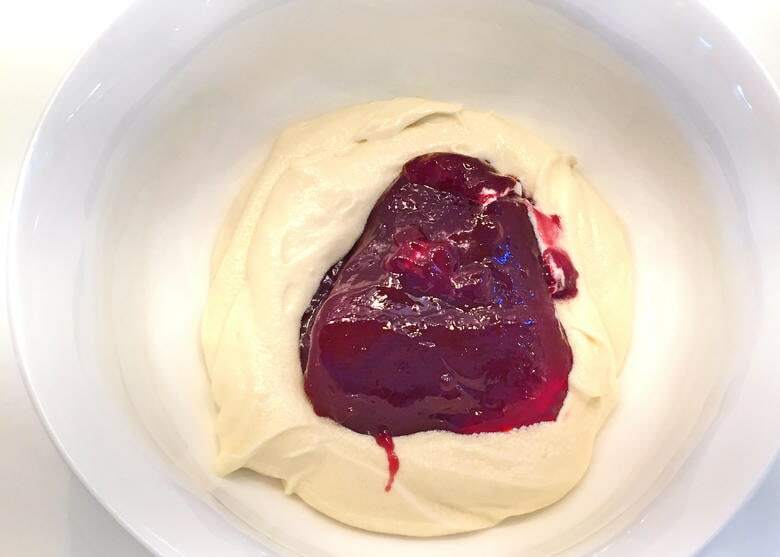 At this point, remove 1 cup of cake batter and put into a separate small bowl, add the raspberry jam, raspberry extract and a bit of red food coloring, blend together. Spoon approximately 2 cups batter into prepared pan. 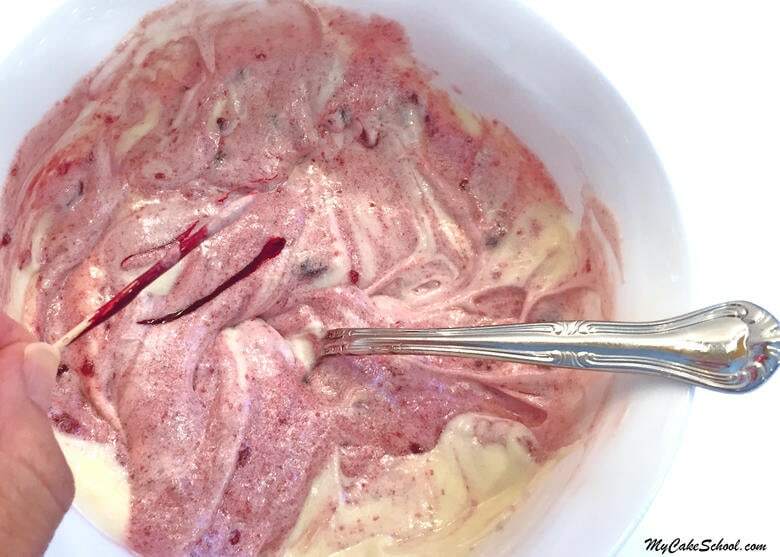 Add the raspberry cake batter, and swirl with a knife, add remaining cake batter, slowly swirl again with knife. Bake at 325 degrees for 1 hour and 5 minutes. Time may vary for your oven. If you find the top of the cake is becoming too dark, cover loosely with a piece of aluminum foil. The cake is done when a toothpick inserted comes out clean or with just a few crumbs attached. Cool in the pan 15 minutes on a wire rack. Remove from pan and let the cake continue to cool. Stir 3 Tablespoons lemon juice into 2 cups of confectioners sugar. The glaze will be somewhat thick but you should be able to drizzle it from a spoon onto the top of a cake. Add more powdered sugar or lemon juice to achieve the consistency you like. **If you do not have cake flour, you can make your own using the following method. For each cup of all purpose flour (plain in the UK) remove 2 Tablespoons (16g) of flour and replace with 2 Tablespoons of cornstarch. For this recipe, there are 3 cups of flour so measure out the flour and remove 6 Tablespoons (48g), and replace with 6 Tablespoons (48g) cornstarch, whisk to blend. If you’re looking for a great classic pound cake recipe as mentioned above, here is another favorite of ours! Classic Pound Cake . This is a flavorful, slightly denser recipe. You can never have too many pound cake recipes in your file of favorites! Or, if you’d like to try an AMAZING Lemon Pound Cake, look no further than this cake recipe from our recipes section: Lemon Pound Cake. It is moist, delicious, and bursting with lemon flavor. *For our full collection of FAVORITE cake and frosting recipes, make sure to scroll through our Recipes Section! If you are interested in cake decorating but don’t wish to join our site just yet, take a scroll through our growing collection of Free Cake Decorating Tutorials! We’d love to have you! Add flour mixture alternately with the milk, at this time also add the extract, lemon juice and zest. Begin and end with dry ingredients (3 additions of dry, 2 of wet). 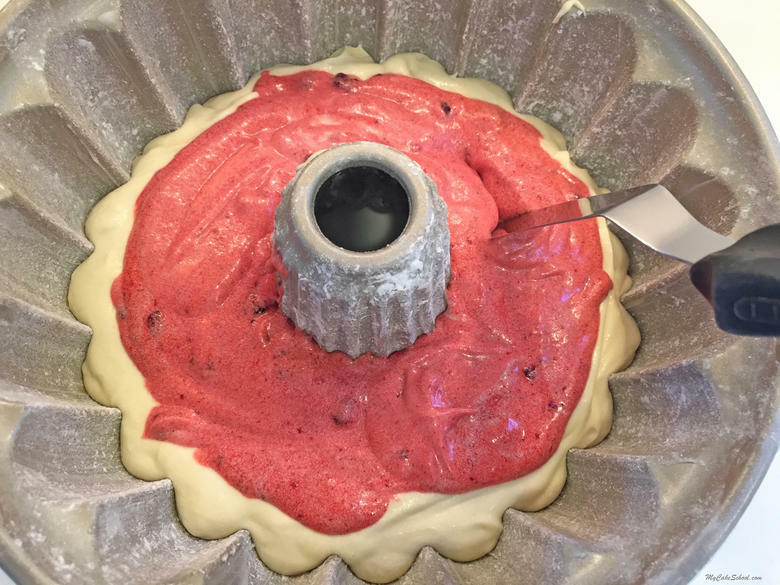 Blend after each addition just until ingredient is blended in…..Do not over mix as this could dry the cake. Awesome, thanks ladies for da lovely recpie ?☺☺m sure to try. delicious! i am pretty sure to try this in home. Can I substitute strawberry for raspberry, especially even if it ‘s just for the topping? Hi Joan, you should be able to substitute strawberry jam for the raspberry with no problem. I am glad you are going to use the recipe! Hi, I need a vanilla cake with raspberry swirl in it and lemon curd between layers. How could I change this to just vanilla? She wants a pronounced vanilla flavor with the raspberry swirl. I was going to make it in 2 8 or 9″ round pans. Would this cake be ok with filling then covered in fondant? 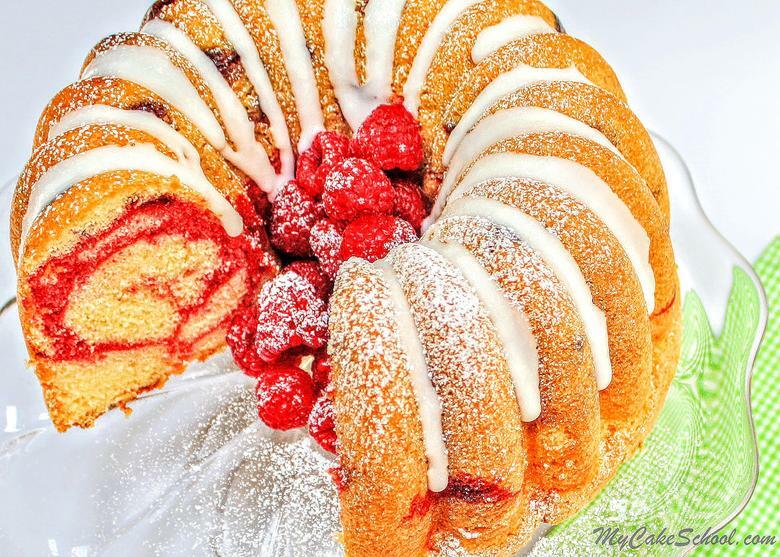 If not, do you happen to have a raspberry swirl cake using a recipe other than pound cake or which vanilla cake from the site would you recommend for adding the swirl to it? Thanks for any help! **Reposting** Posted the following 7 days ago, but no response yet. Is the texture of this “lighter” pound cake more like a regular cake or pound cake?